The first time I toured the Yeomiji outdoor gardens, there was definite deja-vu. Some of the time I was back in Europe but two minutes out I was in Asia again. Talented designers created each of these gardens with great attention to the smallest detail. You might feel as if you're bouncing between countries while your walk from one outdoor garden to the next. 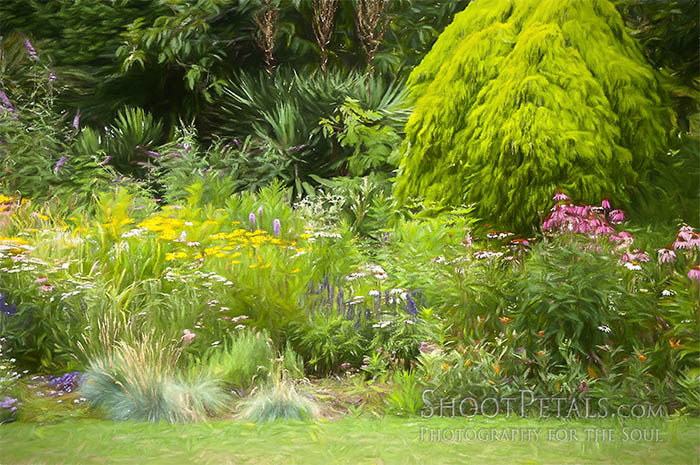 Lovely lush perennial garden with flowers, shrubs and bordering trees. Topaz Impression sofware. The Japanese, Korean, Italian and French are the 4 cultural gardens. Add several theme parks and the Yeomiji outdoor gardens will give you a phenomenal full day garden experience. Have a few extra charged camera batteries in your backpack. If you're looking at the Conservatory front entrance, you can go either left or right to start your tour. Take a quick train tour first so you can plan your route. The little train starts out by passing the Perennial and Japanese Gardens. It finishes at the Conservatory after it passes through the Hydrangea Walk. A great place to start out... the Perennial Garden is to the left of the conservatory. Especially in the spring and early summer there are oodles of flowers and colours galore. A "cameracopia". There are numerous black and gray basalt rocks purposefully placed among the plants. Since you're on a volcanic island, these rocks are integral to the environment. You'll find them in the natural environment or used as building blocks through the garden. Include them in your photos. If it's a clear day, go to the top of the observatory and get a photo of the dormant volcano, Hallasan, in the distance before you leave. Colourful flowers in the Perennial Garden, one of many Yeomiji outdoor gardens. Japanese gardens are built around a few basic, natural elements. Traditional Asian gardens are not formal like ours in Europe and North America. They adopt water in the form of small lakes or ponds as well as streams and cascading fountains. Sometimes, a sand garden can symbolize waves on water but sand and rocks also symbolize hills and mountains. Bridges of different kinds are made of rock, stone or wood. All sorts of trees, shrubs and flowers are used in the Japanese garden, though what springs to my mind are the delicate pink cherry blossoms in spring and the Japanese Maples in the autumn. Every plant is painstakingly chosen, nurtured and manicured but still, the garden is created to be a natural, sacred experience. Yeomiji Botanical Garden, Half-Moon Bridge over the pond in the Japanese Garden. This garden has a variety of irises. They're another critical element of a Japanese Garden... symbols of simplicity and refinement. In my experience, that describes Japanese design in all areas. There are huge blooms of Iris ensata and the water-loving yellow flag irises (l. pseudacorus) growing in a pond with the resident Koi fish, or carp. 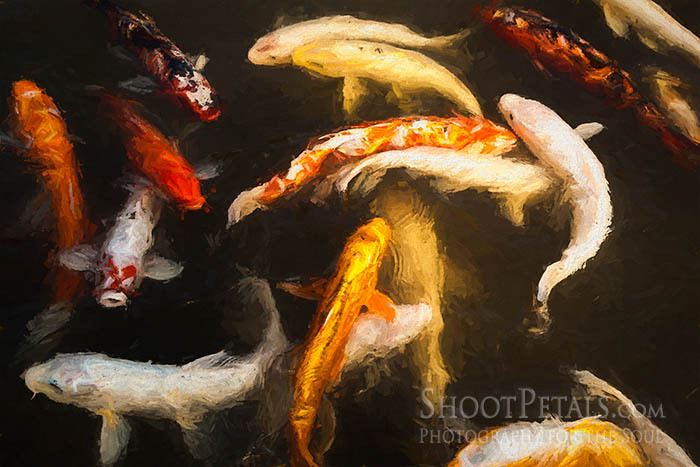 These fish are valued elements in any Japanese garden, symbolizing strength and perseverance. Their flashy colours glimmer in the water and add dynamic energy to the space. I love that they're called "living flowers". They live almost as long as humans... up to 50 years. On one visit, they almost begged for treats. I confess I brought along some tidbits for them and they nearly jumped clean out of the water for them. I'm probably not the first person to bring scraps because they followed me around the pond, mouths gaping open. When I finally threw in a few delicacies, there was a frenzied free-for-all. The hungry Koi fish in the Japanese Garden at Yeomiji Botanical Garden. Painterly photo. Tear yourself away from the Koi fish. 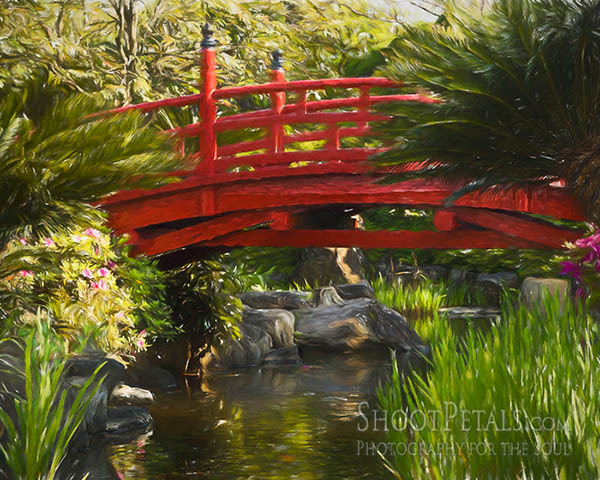 Cross the red wooden bridge over the pond and sit for awhile in the small pavilion on the other side. There's a dry garden of rock and raked sand in front of you. Here's an idea... if you like abstract photographs, photograph the wavy sand and the patterns it forms around one of the rocks. If you practice meditation, this is the perfect, blissful space to claim some quiet time for yourself. When you're ready to move on, follow the path. It's lined with ensata and more luscious irises. There's a cluster or two of tall, slender yellow flag irises in the pond as well. Stay on the path and you'll come out at the road. It leads you behind the conservatory to the next of the Yeomiji outdoor gardens... the Korean Traditional Garden. 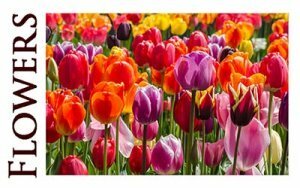 Beautiful flowers from all around the world are available in the shop as both prints and note cards. Browse and find your favourites. Click on the images below. 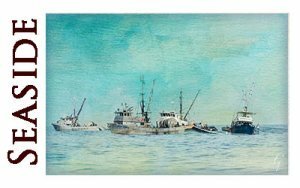 You'll find lots of lovely impressionist Oceanside images of the fishing boats, sea shells and our indigenous animal life as well as the flowers and gardens. Do you like the artistic touch I give my photos? They look like paintings. 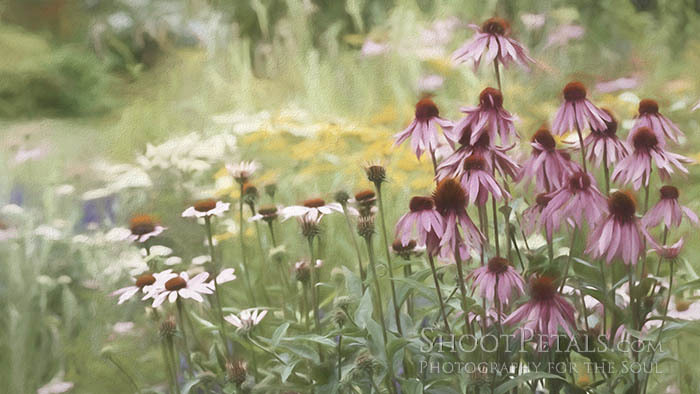 If you would like an image that you don't see in my "print shop", maybe one from Yeomiji Outdoor Gardens, contact me and I'll be happy to let you know if it's available in the size print you want. All images on this page are available as note cards, too. I'm happy when others appreciate my work. If you have a comment, please leave one at the bottom of any page or contact me. 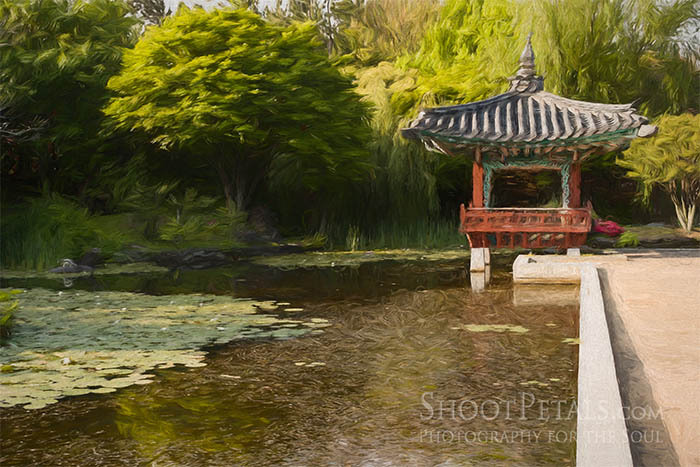 The Korean Garden has the classic turquoise and red-brown wooden pavilion with a small flower garden beside it. The shallow lake has a little island with a base of black basalt rocks. Water cleans and freshens the air, especially in the hot Jeju Island summer weather. Traditional Korean gardens blend with the natural environment. They're uncomplicated and uncluttered with trees, shrubs and water -- ponds, streams or rivers, and maybe some cascading water features. Just like the Japanese garden, water is fundamental to a Korean garden. The serene traditional Korean Garden is one of the 4 cultural Yeomiji outdoor gardens. With all the stresses out there in the world, it's a good idea to live near a body of water. Read Blue Mind by Wallace J. Nichols... it's scientifically proven that "being near, in, on, or under water can make you happier, healthier, more connected, and better at what you do." Asian garden designers knew all of this a very long time ago. I love Western style gardens with their lavish, colourful, dazzling displays of flowering plants. But, I have an equally strong fascination with Asian gardens and their natural simplicity. I'm happy to meditate or photograph in either. But for now, let's leave the Asian gardens behind and move on to the two European gardens. Re-creation of the Fountain Ovato, the Oval Fountain in Tivoli. 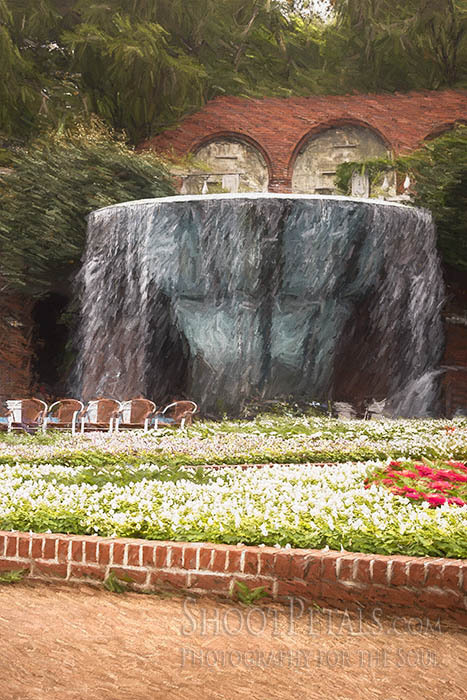 If you come from the Korean Garden, the Italian Garden is next in line. This photo is the scene when you enter. Now you're in Tivoli at the Villa d'Este near Rome, looking at the Fontana dell' Ovato. The original fountain in Italy was built in 1572 and today it's one of the best preserved of the Italian Renaissance gardens. Cardinal Ippolito bought the property when it was a Franciscan monastery and he hired Pirro Ligorio to create his monumental garden. Good choice. 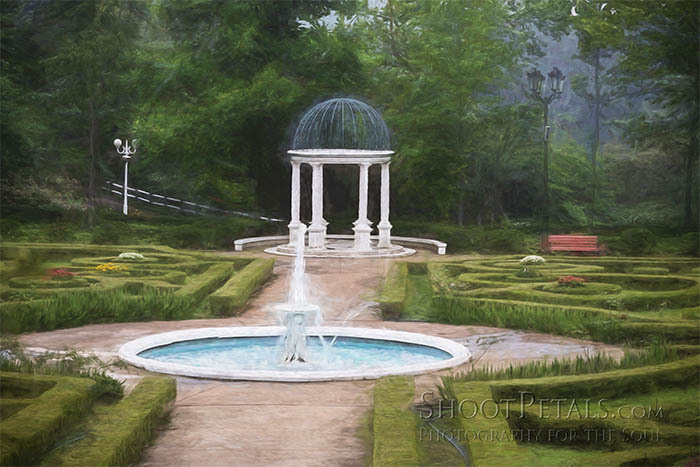 Ligorio was obviously a talented fellow... a painter, architect, and a garden designer. The garden's claim to fame is an impressive system of 100 fountains (but there were actually 200). They were all terraced and fed by two aqueducts. And right here in Yeomiji, we have a smaller, but excellent reproduction of the Oval Fountain, "Fontana Ovato". The water theme is obviously flowing through all of the Yeomiji outdoor gardens. Remember your European history and the aqueducts of Rome? The city was a model for modern society with its abundant running water. It follows that Italian architects and garden designers would incorporate flowing water into their structures. I can't think of any country that doesn't draw on the element of water to enrich its gardens. If you've been thinking about adding a water feature to your outdoor, or indoor, garden space, here's a good read in BBC Wildlife Magazine. The Italian Garden viewed from the formal French Garden. Yeomiji outdoor gardens. Every time I'm there, I sit beside the fountain and watch the water cascade over the edge and plunge into the pool below.... mesmerizing. This is no piddly little fountain. It's gigantic. Pull up a chair, relax, close your eyes and listen to the cascading water. Water is fun to photograph and this reproduction of the Fontana Ovata gives you lots of artistic options. Need a refresher on shutter speed? Here you go. The Italian Garden meets up with the ultra-formal French Garden at the top of a short slope. Walk down either side into the beautifully manicured hedges and abracadabra - you just crossed over into France. 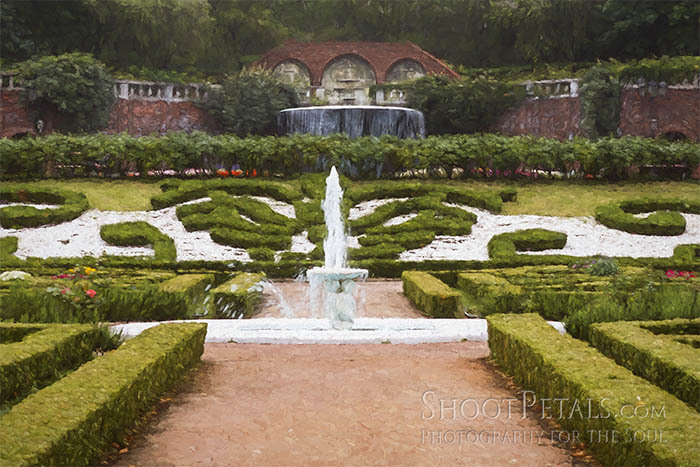 I photographed the classically formal French Garden in the morning fog. It was the rainy season. Perfectly manicured hedges and roses bushes, a splashing fountain... and a direct view of the Italian Fontana dell'Ovato up the hill. The Garden has a small but vivacious fountain. The bowl is held up by four chubby little cherubs. This is a super opportunity to use leading lines, angles and patterns in your photography composition. You must line up horizontal and vertical lines absolutely straight before you click the shutter. If they're off even by a tiny bit, the photo will look sloppy. Use a tripod because it's impossible to hold your camera steady enough. The formal outdoor French Garden at Yeomiji continues up an incline to meet with the Italian Garden. The traditional French garden is anything but casual and loose. The French take pride in exercising a certain intellectual touch when it comes to their gardens. Though that's how they approach life in general, from business to pleasure. From the magnificence of Versailles to this relatively tiny garden, elegance and balance is prime. 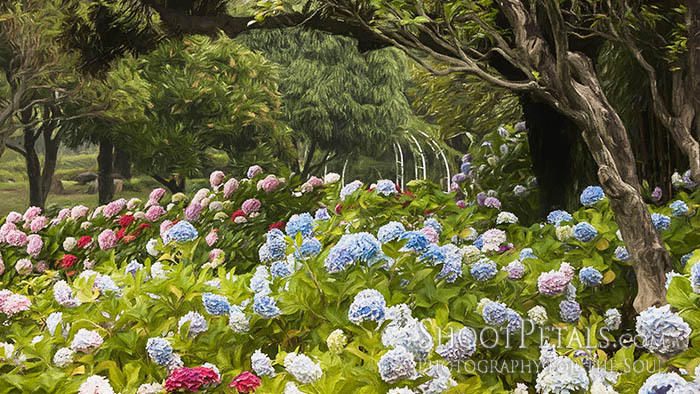 Yeomiji outdoor gardens, painterly image of the Hydrangea Walk in full, colourful bloom. Such a pretty walk in June when the hydrangeas are in bloom. So many different colours of blossoms... and dainty flowers to photograph. I usually use a Lensbaby, but this photo was taken before I got my Velvet 56 lens. This is where the tour wraps up for the Yeomiji outdoor gardens. In a minute you'll be back at the observatory and indoor gardens. The Lawn Garden is beside the conservatory. Mostly grass with a topiary peacock sporting pink flowers for tail feathers. Ornamental trees and some basalt sculptures grow along the edges of the lawn. This is where families relax and perhaps have a picnic. Lots of nice landscape photography here. Even three colourful miniature Dutch windmills sitting in a flower garden. There are usually families playing or relaxing on the lawn. When you finish your walking tour, go back into the observatory and look down onto the lawn garden. You'll also get an expansive view of all the outdoor gardens and beyond. Here's where you'll find information and photos of the Centre Hall and Observatory. 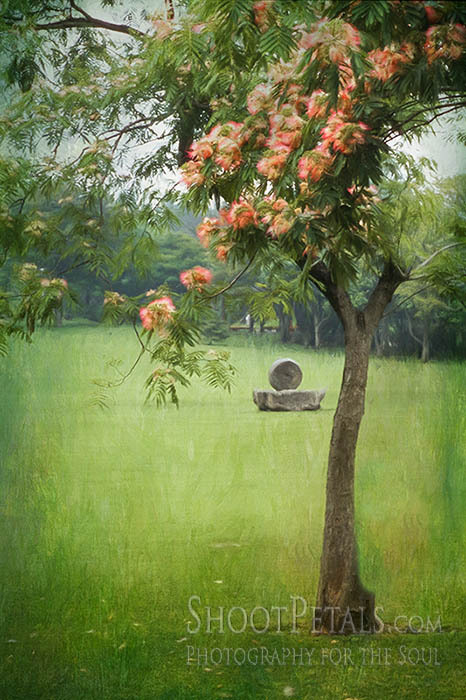 In this shot, a Red Horse Chestnut frames a volcanic rock sculpture and it perfectly blots out a boring gray monsoon sky. 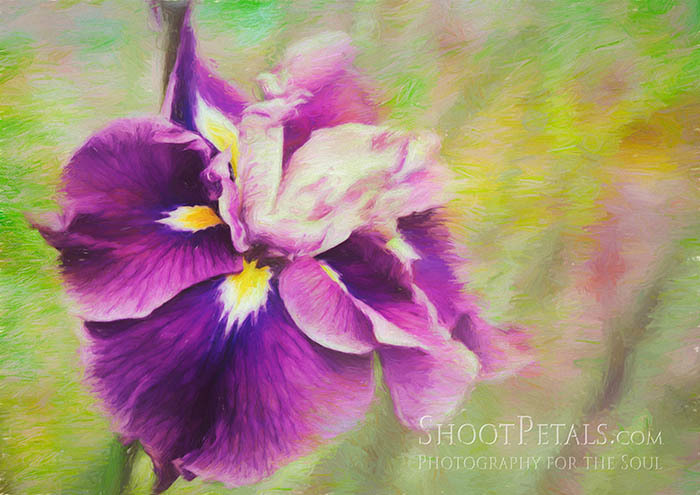 Yeomiji Outdoor Gardens, Iris ensata in the Japanese Garden - a painterly photograph. I haven't even touched on some of the significant gardens so I'll leave it to you to visit and see them for yourself. It's worth it to spend the extra time at the Endangered Species and Cheju Native Plants Gardens. The garden works with the Ministry of the Environment to preserve plants at risk or extinction and restore them to their natural environments. Halla Mountain has a distinct environment with very specific subtropical and temperate zones where native plants have thrived in the past. These native plants need to be protected and both visitors and islanders educated. Add more onto the menu... the Bog Garden and the Herb Garden where traditional medicinal herbs are grown. Give it another hour for these important gardens. The Yeomiji outdoor gardens are only a third of this astonishing botanical experience. That's why I suggest you give it a few days and not just a few hours.